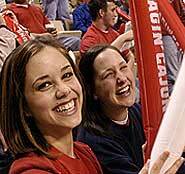 The University of Louisiana at Lafayette Alumni Association is hosting Grad Expo 2004 on March 10 from 10 a. m. to 5:30 p. m.
The Grad Expo is a one-stop shopping event where students can purchase all their graduation items. Seniors can take advantage of many services and specials such as; free cap and gown with a class ring order, discounted health insurance for the transition after graduation, ordering a cap and gown, ordering an official class ring, taking professional cap and gown pictures and much more. Free food and drinks will be provided and door prizes with be given away. The event is sponsored by the UL Lafayette Alumni Association, Acadiana Bottling, Art Carved, Jostens, University Bookstore, and Association of Future Alumni. This will be the last opportunity students will have to purchase official UL Lafayette graduation items through the university. For more information, call the Alumni Association at 482-0900.